We are interested in all manner of things associated with arthropods at low temperatures (and sometimes at high temperatures, too!). Below you can read about some of the things happening in the lab. Watch this space and the publications page to see how things develop. 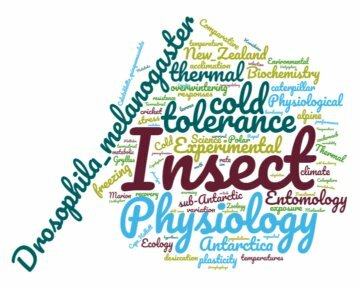 Mechanisms underlying insect freeze tolerance - That's why I started studying insects in the first place, and we have some great new model systems in which to study it. Expect to see lots of exciting action from the lab in the next few years, focusing on the molecular physiology of insects that survive internal ice formation. This is also the primary area of recruitment in the Sinclair lab right now. Evolution of thermal biology - Together with Thomas Buckley of Landcare Research, we are using the well-documented radiation of New Zealand stick insects to understand how thermal performance curves evolve. Multiple stressors during overwintering - Winter brings with it lots of stressors besides cold - we are exploring the interactions between cold, immune and chemical stress in the hopes of figuring out how to predict the impact of interacting stress. Temperature effects on the immune system and microbiome - We are not alone! All animals carry with them a huge community of symbionts and potential pathogens. It'd be great to understand how these little creatures interact with their hosts to modify responses to the environment. 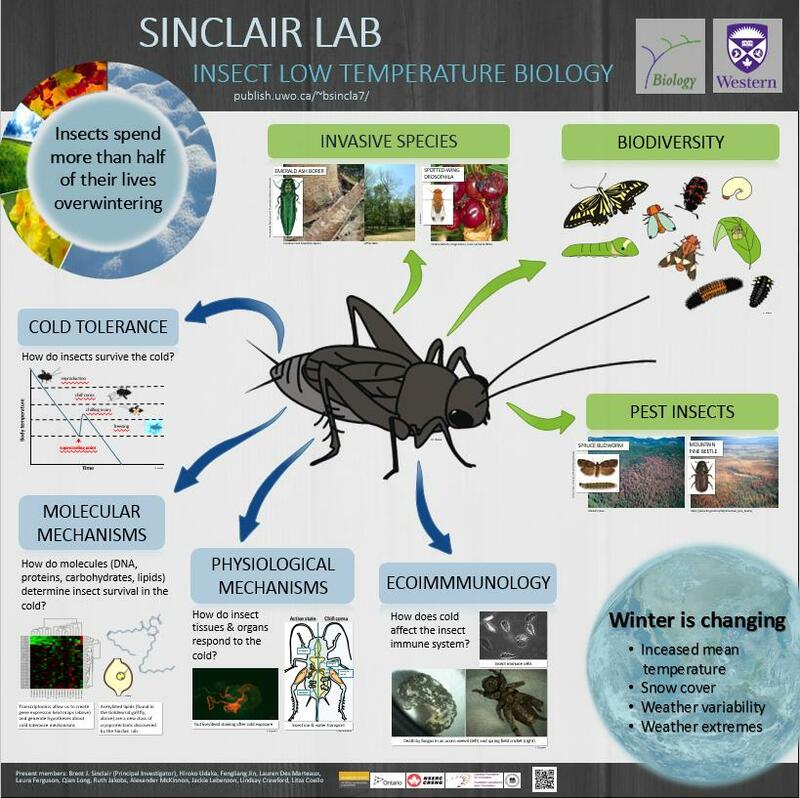 Ion and water balance in the cold - For a decade or so, our lab has been at the forefront of understanding how insect ion and water balance is affected by low temperatures. Plenty of fun things going on still! New tools for studying insect cold tolerance - Exciting things are afoot when it comes to conducting manipulative experiments to understanding the mechanisms underlying insect cold tolerance. We're working on RNA-Seq, RNAi, CRISPR/Cas9 and all sorts of other goodies! Overwintering energetics - We've been working on energetics and metabolism of overwintering insects (and frogs, once), and are continuing to do this, mainly with pest insects at the moment. Invasive species biology - One of the first questions people ask when a new pest comes to Canada is 'it's kind of cold here... will it survive the winter?' Well - we're the people to ask if you want to find out! We work on many of the biggest and baddest insect pests in the world right now, including spotted-wing Drosophila, Asian Long-horn Beetle, and Brown Marmorated Stink Bug. Our Asian Long-horn Beetle work is part of the Genome Canada-funded BioSAFE project.